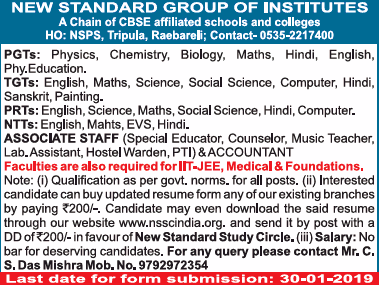 New Standard Group of Institutes, Raebareli, Uttar Pradesh Advertised in Times of India E paper for the Teachers recruitment 2019 –PRT Jobs, TGT Jobs, PGT Jobs For More Details see below. About School: Our vision is to be the premier education hub of international repute. Our aim to make learning a national culture, encouraging creativity and innovating at every level of society, which goes beyond the parameter of schools and educational institutions.